This brand was introduced in June 2006 and has many loyal consumers most of whom became adorers after their first trial. It is positioned in the market as a ready alternative to local food items. Our Semolina brand is, without exaggeration, the quality brand in Nigeria. The demand is very strong, outstripping our production capacity as a result of which we had to expand our semolina extraction capability later in 2006 after its introduction and then again in 2007. A further expansion of extraction capability is planned for the year 2009. Honeywell Semolina comes in unique and colourful packaging, easily identifiable (looks green-white-green). Honeywell Semolina is superfine in nature and creamier in colour than other semolina brands. This gives it a very good look and feel. 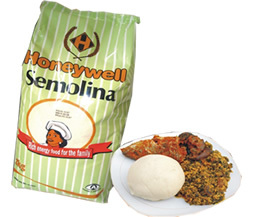 Honeywell Semolina’s quality allows it to turn into a jelly paste quickly during preparation. This makes it very easy for busy housewives and other domestic servants to prepare without stress. Honeywell Semolina absorbs more water than other Semolina brands and therefore give higher yield. This is important for large families (especially DE income group) and food vendors. Honeywell Semolina moulds very well in the hand, comparable or even better than pounded yam – it doesn’t break and mess up the hand. Honeywell Semolina has a unique, pleasant taste and aroma in the mouth making for pleasurable eating. Honeywell Semolina retains its freshness, firmness and consistency for much longer after preparation; so it can be prepared well ahead and kept in the cooler. It is especially appropriate for dinners at home; for group outings; and for restaurants/food vendors.